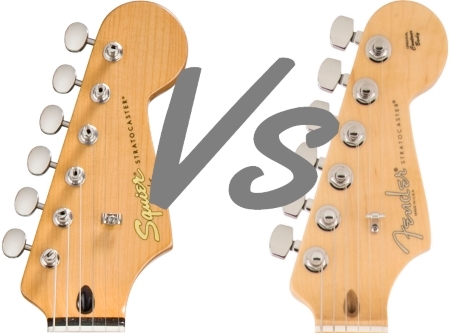 There's a lot of snobbery surrounding the whole Squier Strat vs Fender Strat comparison. Keep in mind, however, that the negative generalisations that plague Squier's reputation tend to come from less experienced gear heads who are fixated with brand and image over pure playability and tone - both very subjective things. It is the veterans of the guitar world, who have tried and tested gear right across the price spectrum spanning several decades, who can help to put things into perspective when it comes to weighing up the true value of these instruments, regardless of whose name is on the headstock. The reviews and forum discussions make it pretty clear - Squier have come on leaps and bounds in offering bang for buck. Costs are being cut more intelligently, manufacturing is cheaper and quality control has improved significantly. While the price difference between the Squier and Fender stratocasters is considerably smaller than with the Epiphone and Gibson Les Pauls, there's still little doubt that the Fender name alone represents a hefty chunk of the price you pay for a Mexican and USA made Strat. Like in most industries, you inevitably pay in part for a name and its reputation. As the Stratocaster has become one of, if not the most iconic guitars of all time, there's a lot of weight behind the Fender brand from its prestigious history. That alone adds a significant premium. Of course, the problem with trying to make any direct comparisons between the Squier and Fender is that there are over a dozen models, each with different pickups and their own individual features. Apples and oranges come to mind. However, there are certain differences, intrinsic to the production of the guitars, that can help us weigh up the overall difference in quality. Many of these differences you'll already know, such as today's Squier guitars being produced in China and Indonesia, where labour and manufacturing is far cheaper than in the US. There was a retrospective golden era for Squier during the 80s with their Japanese JV and SQ models. Many experienced players will tell you the quality of the MIJ (made in Japan) models was as close to the MIA (made in America) Fenders as you'll find. You can still find these going under the hammer on Ebay, but they are no longer considered true budget guitars - again, their history and reputation precedes them and inflates their value! US made Fender Strats receive more hands-on attention during the production process, which means more discerning quality control for each individual guitar at each step of the way. Key elements affected by this are truss rod and bridge installation, neck joining and nut, fret and body finishing. It all adds up to a higher quality, impeccably finished product. Quality still varies, of course, but with more hands-on workmanship, there's less chance of a "bad batch", more likely the odd one or two falling below par. That's why, even with $1000+ guitars, it's important to try out several models in store if you can. Materials are another major criteria in cost difference. When producing in the numbers Squier do (technically Fender, since they own Squier), even what would be under a dollar's worth of saving on, say, an output jack or thinner wiring, works out hundreds of thousands of dollars worth of saving over a year of production and hundreds of thousands of guitars. So when people talk about Squiers consisting of cheaper materials, taking the parts individually it's more subtle than you might think. But extrapolated across the entire production quantity it all adds up and it becomes clear how Fender can afford to sell even their highest quality Squier models at less than $400 a piece. A cheaper alternative to the MIA Fender Strat is the MIM (made in Mexico) Strat, with the Mexican Standard going for around $600 new, compared to over $1000 for the American Standard. So a considerable difference in price, again due to cheaper labour and manufacturing outside of the States. Many people automatically assume a Mexican Fender will be higher quality than a Chinese Squier, and this is perhaps true if you take the Squier Standard Strat as the benchmark. However, Squier's relatively new Classic Vibe series (around $200 less than the MIM) has seriously blurred the line between high-end Squier and budget Fender quality, with an evaluation of hundreds of reviews and forum comments leading to the CV earning a place on the best cheap Stratocasters page. As with all cheap guitars, the lower cost allows you to customise and upgrade to suit your personal taste, both in look and sound. Modders favour Squiers because they provide a solid foundation on which to build a premium quality instrument, for hundreds less than your big brand custom shop axes. As the materials and construction on newer Squiers are of generally decent quality, they provide a solid platform for customisation. Even light upgrades, such as new pickups, electronics, bridge, tuners etc. can bring these modestly priced clones to life and not only rival the "real deal" but truly distinguish them from any other guitar out there. The most commonly bought Squiers for modding are the Bullet, Affinity (with its slimmer neck profile), Standard and Vintage Modified series (which offer humbucker/single coil configuration). The Classic Vibe series is also a strong modding platform, but being the most expensive Strat in the Squier range, there is more emphasis on its stock (factory) quality. Blind test - answer below! For those who can't afford the American Standard and were therefore thinking of getting the MIM, save a couple hundred more bucks, swallow some pride and go for the Classic Vibe instead. Even if you're buying used, the CV represents far better value for money and, many contend, with better stock pickups. This is supported by an overall user rating of 89 for the Mexican Fender Standard and 92 for the Squier Classic Vibe. For anyone whose budget is under the $500 mark, assuming you don't get lucky and find a used MIA Strat for that, the Classic Vibe is the best option for an ultra playable, classic, 3 single coil Strat spec. If your budget is even tighter, it's definitely worth saving up for the $350-$400 CV (or find a used one) rather than blow your hard earned on the less impressive Bullet or Affinity Strat, unless you are an absolute beginner or prepared to spend time and extra money upgrading.